Bacteria destroy toxic environmental pollutants that include chlorine or bromine atoms. Reductive dehalogenase. Another protein subunit, shown here schematically, tethers the complex to the membrane. The chlorine-containing compound is in green, the cobamide cofactor is in turquoise, and the iron-sulfur clusters are in red and yellow. Halogens (fluorine, chlorine, bromine, and iodine) play essential roles in our lives. For example, several thyroid hormones must include iodine atoms for proper function. Chloride ions, which are obtained from the salt we eat, play diverse roles in basic cellular function and nerve transmission, and are shuttled from place to place by specialized chloride channels. However, halogens are highly reactive, so they often pose grave dangers. Industrial halogenated compounds are commonly used as solvents (for example in dry cleaning) and as pesticides (such as DDT). Unfortunately, many are toxic or carcinogenic, and cause problems when they escape and pollute the environment. Many bacteria detoxify and clean up these dangerous compounds, using dehalogenases to remove the halogen atoms, producing simpler compounds that may be further broken down for energy. The one shown here, from PDB entry 4ur0, is a reductive dehalogenase. It has an added advantage: it uses the chloride-separating reaction as a source of energy, similar to the way that oxygen is used by cytochrome c oxidase in our own electron-transport chain. Researchers are exploring these bacteria as a way to clean up areas polluted with halogenated compounds. This dehalogenase uses several molecular tools in its reaction. During the reduction reaction, it needs to feed two electrons into the halogenated molecule. These are delivered by two iron-sulfur clusters. The reductive reaction also requires a cofactor similar to vitamin B12, which has a cobalt atom in the center. Together, the enzyme and these cofactors position the halogenated compound, add electrons, and replace the halogen atom with a hydrogen atom. Two dehalogenases and two of the reactions they perform. Other dehalogenases don’t try to couple the reaction with energy production, and instead simply use a water molecule to split off the halogen. Two examples are shown here, which perform successive reactions in breaking down small compounds like dichloroethane. The first is a haloalkane dehalogenase (PDB entry 2dhc), which removes one chlorine atom and replaces it with a hydroxyl. Then two other enzymes convert the hydroxyl into an acid (not shown). Finally a haloacid dehalogenase (PDB entry 1jud) removes the chlorine atom. Three structures of a reductive dehalogenase (PDB entries 5m2g, 5m92, 5m8u) capture the enzyme as it successively removes bromine atoms from a brominated compound. 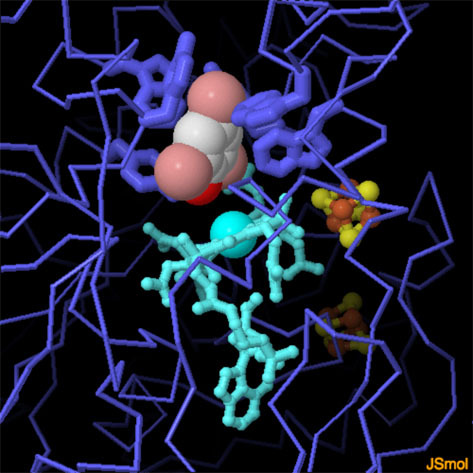 The cobamide cofactor (light blue) helps position the molecule by interacting with a hydroxyl group, and six tryptophan and tyrosine amino acids (dark blue) make a cage around the active site to interact with the halogen atoms. The structure with tribromophenol (carbon in white, bromine in pink, and oxygen in red) is shown here. Click on the image to explore this and the other structures in more detail. There are many structures of dehalogenases with different halogenated compounds—try searching for “dehalogenases” to see them. There are also many enzymes that add halogen atoms to compounds. Search for “halogenases” to explore the structures of some of them. You can use the Ligand page to explore the properties of the cobamide cofactor and vitamin B12. M Fincker & AM Spormann (2017) Biochemistry of reductive dehalogenation. Annual Review of Biochemistry 86, 357-386. 5m2g, 5m92, 5m8u: C Kunze, M Bommer, WR Hagen, M Uksa, H Dobbek, T Schubert & G Diekert (2017) Cobamide-mediated enzymatic reductive dehalogenation via long-range electron transfer. Nature Communications 8, 15858. 4ur0: M Bommer, C Kunze, J Fesseler, T Schubert, G Diekert & H Dobbek (2014) Structural basis for organohalide respiration. Science 346, 455-458. 1jud: T Hisano, Y Hata, T Fujii, JQ Liu, T Kurihara, N Esaki & K Soda (1996) Crystal structure of L-2-haloacid dehalogenase from Pseudomonas sp YL. An alpha/beta hydrolase structure that is different from the alpha/beta hydrolase fold. Journal of Biological Chemistry 271, 20322-20330. DB Janssen, F Pries & JR van der Ploeg (1994) Genetics and biochemistry of dehalogenating enzymes. Annual Review of Microbiology 48, 163-191. 2dhc: KH Verschueren, F Seljee, HJ Rozeboom, KH Kalk & BW Dijkstra (1993) Crystallographic analysis of the catalytic mechanism of haloalkane dehalogenase. Nature 363, 693-698.